Since Augustine “Jay-Jay” Okocha retired from international football in 2006, the Nigeria national football team have struggled to find attacking midfielders of Okocha’s qualities. I am not implying that Chidi Osuchukwu, the playmaker of Dolphins FC, can become the new Okocha but it is a fact that Osuchukwu currently is one of the greatest attacking midfielders in the Nigeria Premier League. Many experts expect Osuchukwu to achieve great things as a footballer, also outside the Nigerian borders. Dolphins FC, based in Port Harcourt, southeast in Nigeria, are the current leaders of the Nigeria Premier League 2010-2011. Chidi Osuchukwu started his professional career at Gateway FC, based in Abeokuta in the southwestern part of the country. My first records of Osuchukwu are from the season 2007-2008. Osuchukwu was part of the Gateway FC side that won promotion to the Nigeria Premier League after the season. 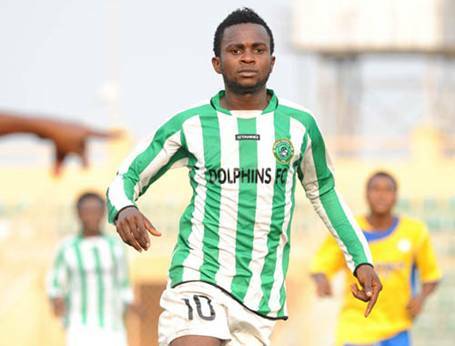 In 2008-2009, Osuchukwu scored 5 goals for the newly promoted side, his first season in the Nigeria Premier League. Osuchukwu received rave reviews and at the end of the season, he was training with the Nigeria U-20 national football team. At this time, Gateway FC had a rather impressive homepage by Nigerian standards. According to the homepage, now removed from the web, Osuchukwu’s date of birth was 16.02.1990 and his main position was “left-back”. Osuchukwu started the 2009-2010 season at Gateway FC, who was struggling hard in the first part of the campaign. Nevertheless, Osuchukwu had caught the eye of several bigger clubs and he decided to join ambitious side Dolphins FC during the season. Interestingly, Osuchukwu had scored against Dolphins FC during the 2007-2008 season, when both teams were playing at second level at the Nigerian football pyramid. Osuchukwu scored one goal for Gateway FC and one goal for Dolphins FC during the Nigeria Premier League 2009-2010. In May 2010, Osuchukwu was yet again training with the Nigeria U-20 national football team. At the time of writing, Dolphins FC have played 16 matches in the Nigeria Premier League 2010-2011. Osuchukwu has been struggling with and ancle injury and has also lost some matches due to sessions with the Nigeria U-20 national football team. Nevertheless, his performances have been impressive and Osuchukwu is an important creative player at a side that has been focusing mainly on their defensive work. Osuchukwu has scored one goal during the current campaign, against Crown FC on 02.01.2011. Osuchukwu made the Nigeria Premier League “Team of the week” after this match. As far as I know, Osuchukwu’s all time scoring record in the Nigeria Premier League is eight goals. Although Osuchukwu apparently has been a left-back earlier in his career, it is no doubt that he is an attacking minded player, mostly used as an attacking midfielder / playmaker. Sometimes Dolphins FC play with Abdul Ajagun and Osuchukwu at the wings and Victor Michael, Emma Nwachi, Owusu Addai or in-form Derick Amadi as a center forward. Osuchukwu has also played as a support striker, and this versatility is one of many reasons that I find him so interesting. Osuchukwu has been described as an “intelligent and extremely creative playmaker”, a “star midfielder” and a “sleeky striker” who always gives his all when he gets on the pitch. The respected journalist Colin Udoh recently quoted that Osuchukwu surely is “one of the shining prospects in the Nigeria Premier League”. Earlier this month, Osuchukwu was once again training with the Nigeria U-20 national football team, which was rather surprising to me based on the date of birth I found on the official homepage of Gateway FC, 16.02.1990. The Nigeria U-20 national football team are preparing for the Orange African Youth Championship to be played in Libya from 18.03.2011 to 01.04.2011. Last week, Nigeria U-20 played a friendly match against Libya U-20. The match ended 1-1 and Nigeria’s goal was scored by Chidi Osuchukwu. he is truely a great player and he is good enough to play 4 the super eagle in the midfiled.